We’d love your help. 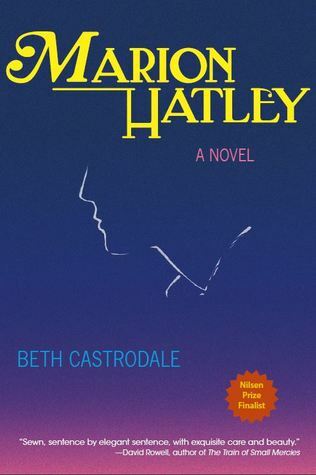 Let us know what’s wrong with this preview of Marion Hatley by Beth Castrodale. To escape a big-city scandal, a Depression-era lingerie seamstress flees to the countryside, where she hopes to live and work in peace. Instead, she finds herself unraveling uncomfortable secrets about herself and those closest to her. In February of 1931, Marion Hatley steps off a train and into the small town of Cooper’s Ford, hoping she’s left her big-city problems behin To escape a big-city scandal, a Depression-era lingerie seamstress flees to the countryside, where she hopes to live and work in peace. Instead, she finds herself unraveling uncomfortable secrets about herself and those closest to her. In February of 1931, Marion Hatley steps off a train and into the small town of Cooper’s Ford, hoping she’s left her big-city problems behind. She plans to trade the bustling hubbub of a Pittsburgh lingerie shop for the orderly life of a village schoolteacher. More significantly, she believes she’ll be trading her reputation-tainting affair with a married man for the dutiful quiet of tending to her sick aunt. Underpinning her hopes for Cooper’s Ford is Marion’s dream of bringing the daily, private trials of all corset-wearing women—especially working women—to an end, and a beautiful one at that. Instead, she confronts new challenges: a mysteriously troubled student; frustrations in attempts to create a truly comfortable corset; and, most daunting, her ailing aunt. Once a virtual stranger to Marion, her aunt holds the key to old secrets whose revelation could change the way Marion sees her family and herself. To ask other readers questions about Marion Hatley, please sign up. Really enjoyed this well-written period piece about a talented and independent woman finding her place in the world despite family secrets and personal hardship. Wonderful!! Such a delight! Castrodale's historical fiction made perfect fodder for this blizzarding day when I am sadly just a tad under the weather. I love Marion Hatley. She's an unforgettable character. The book offers lots of story to carry you through page by page, with sprinklings of everything from lingerie to pirates. love a book with a strong female lead. It allows me to jump into the shoes of the main character, to see the world from her perspective. Marion Hatley decides to head to Cooper's Ford, a small country town, leaving her big city life (with it's problems and scandals) behind. She must start anew and readjust to her new world, all while trying to find her footing, set herself up financially and face new challenges head-on. One of the trials that Marion faces, is designing a new and comfortable cors love a book with a strong female lead. It allows me to jump into the shoes of the main character, to see the world from her perspective. Marion Hatley decides to head to Cooper's Ford, a small country town, leaving her big city life (with it's problems and scandals) behind. She must start anew and readjust to her new world, all while trying to find her footing, set herself up financially and face new challenges head-on. One of the trials that Marion faces, is designing a new and comfortable corset. I found this aspect of the book utterly fascinating, as the travails of corset-wearing heretofore hasn't been on my study radar. (Also, my Google history is now filled with searches like "Corsets of the 30's," and "Uncomfortable corsets," and "Why women stopped wearing corsets." #nerdproblems) I found myself absolutely loving everything about Marion, her strength and her determination, as well as the part of her that perpetually remained a misfit. I was also equally drawn to the other characters in the book, which is a rare treat! I found myself wanting to know more about Elder, Ina and Walter, wondering where their story might lead, hoping for a happy ending for each of them. I need to preface this review with I LOVED Castrodale's other two books: Gold River and In This Ground. Marion Hatley is her first novel. (I read her works in reverse chronological order.) Maybe if I had read this first, it would have been four stars. While I enjoyed this book and it kept me occupied on a recent trip, I didn't love it. I did appreciate the message. Castrodale sets the tale during the Depression. Obviously during the first half (at least) of the 20th Century, women had few option I need to preface this review with I LOVED Castrodale's other two books: Gold River and In This Ground. Marion Hatley is her first novel. (I read her works in reverse chronological order.) Maybe if I had read this first, it would have been four stars. While I enjoyed this book and it kept me occupied on a recent trip, I didn't love it. I did appreciate the message. Castrodale sets the tale during the Depression. Obviously during the first half (at least) of the 20th Century, women had few options, especially unmarried women. Being a seamstress was acceptable (unless you made racy underwear) and serving as a school marm (until you got married) was appropriate. You could also be a care giver for an elderly relative. Marion does all three. The reason she is called to the bedside of her aunt becomes quite obvious to the reader (long before it does to Marion). Marion was a watcher of women; she watched to see how uncomfortable they might be in their corsets. She also looked deeper, especially in the town she runs away to. There she looks at the women to see their talents and needs. She becomes a financial savior to many and a true hero to at least one family. What a wonderful book! Written in a way that makes for a fast, enjoyable read, this novel was completely engrossing and thought provoking. This is a story about a woman who had to move away to escape a "scandal" and instead finds out secrets about herself and the people she has become close to in her new surroundings. Chock full of 1930s stereotypes and situations, this is the best kind of historical fiction!